Wow! 2019 is here, but I have to be honest, as I’m writing this post for a late January blog entry, I do not feel ready for 2019 yet. I’m still preparing for it and reeling with a heady kind of excitement about all the good things that happened in 2018. I went into December determined to catch up on rest, prepare for Christmas, get really organized for 2019, and celebrate. While I did manage to do some of all those things, I’m still not as rested or organized as I’d like to be. When I’m not rested, I also tend to get emotional and easily side-tracked. My focus becomes blurred and I find myself straining to keep my eyes on Christ and the things I know He has purposed for me. That means I need to pull away and take more time out for praise, prayer, devotions, rest, and rejuvenation. Desperately needing to re-fuel, as December came to a close and January began to kick in, I recorded 5 Hallmark Christmas movies and a “When Calls the Heart” Christmas episode to watch when I felt ready to pull away from a plethora of other activities I’d deemed necessary to cross off the list before I could take that much needed time off. After all, I’d cleaned out the closets, the whole household had helped put away the decorations, I’d updated the address book, I had a jump on marketing efforts for January and February, and I had painstakingly done most of my 2019 calendars and planning. With several severely overdue projects finally done and some household cleaning out of the way, the holiday hustle and bustle over with, I thought I’d finally be able to take a few days off to enjoy life and not do anything. No writing, no marketing, no cleaning, no running errands, no work, no going anywhere! My plans would include making dinner and watching romantic love stories on the Hallmark channel for a few days…and that’s about it. Ah, it would be almost like heaven…a real, staycation. Bear with me. As a writer, I keep my writing schedule fairly rigorous during the year. I generally only allow myself about one movie a week and it’s usually Masterpiece Theater. Every now and then I’ll enjoy a football game with my husband or some other movie with my family. Since I didn’t get to watch much television this year, I thought a day or two of movies followed by a few days of reading, doing my nails, and so forth would give me that much needed refueling time. Maybe I’d even get to finish a crochet project or start a new cross stitch. Reading a few books might take me two or three more days. Then, with some proper rest and prayer time, I’d be ready to really begin writing again and able to dive into 2019…or so I thought. When hubby ran an errand and returned to say he’d run into a cable tech guy who could give us a better deal than our current cable provider, and the fellow would be stopping by within the hour, all of my hopes were dashed. There went the DVR out the door…and all of the movies I was so eagerly waiting to watch. Now, a new and very empty DVR from our new cable provider sat staring back at me from the entertainment center. I felt irritated, disappointed, and already had a mild case of the blues from having one delayed opportunity after another to take some time off other than the usual Sabbath rest we take on Sundays. All of the movies I’d recorded and carefully chosen, slated for my days off, were gone. I could only remember one of the titles. It might not seem like a big deal to you, but to me, it was almost gut-wrenching. I should have spoken up and asked the cable man to return in a few days to give me a chance to watch those movies I’d so meticulously chosen to record. Anyone who knows me knows I’m ultra-choosy about what I watch on television. It will take me an hour of looking at the television guide to decide on what to record. I suppose I could have asked the cable dude to return later, but then I’d have had to deal with the cable install in the middle of my staycation. Sigh. I shook my head and wiped tears out of my eyes over a cup of coffee a few days later—after returning the old cable boxes to our previous cable provider, recording not just 5, but 10 new Hallmark movies, running several errands, and keeping several unavoidable appointments. Would I ever be able to take a few days off to refuel? Overworked, tired, and frustrated, a wave of negative emotions and thoughts swept over me. You know—the kind that tend to slowly creep in for weeks on end when you’re trying to get to that overdue staycation. It isn’t always easy being an author. I mean, we’d fought a hard battle to get to this point. Years of healing, hours of prayer, tons of Bible study, lots of forgiveness, being okay with some things that still weren’t resolved…some things that might take time and others that might never be. The treehouse remodel was still not done. The cover to the hot tub that still hadn’t been hooked up to electric had begun to severely deteriorate. I had an unanswered prayer about a childhood friendship. I was hoping more book reviews would come in and instead, I’d had three critical ones that were plain hurtful. Our son hadn’t finished painting his room. There were three or four places in the house that still needed new baseboards. I lamented that my aunts, uncles, cousins, and other extended family were so spread out across the nation and we weren’t able to have those great big family Christmas dinners anymore, even though I’d just enjoyed having my sister and her family with us for Christmas. I felt sad that we’d had to improvise on a household project and postpone several other really needed updates due to budget restrictions. In fact, there were several provision issues going on and I was feeling frustrated about some other things that would take more time than this blog post would allow me to share. On top of everything else, I grappled with the enormity of some of the battles we’d come through. There were some things I’d never be able to put into words about it. In short, I was feeling turbulent. Things are definitely not exactly where I’d like them to be, but how far they’ve come. I had some pretty mixed emotions going on. Life is much, much better, but there are still a lot of hiccups and bumps in the road to overlook as I try to be patient and accepting of what cannot be changed. We still have the battle scars to prove what we’ve come through, and some of them run pretty deep— even though I know I’m healed from far more than I’d ever expected. Some scars don’t go away because they remain with you for life, and some eventually fade away, but they take time. Tortured for Christ sounded really serious. Sure, it may not have been real whips or chains or like the kind of torture Jesus went through for you and me on the cross, but the Lord was letting me know He’d seen every tear, every moment of agony and suffering, every battle, every delay, each setback…and each victory, too. He was well aware of how each situation had affected me, us, my family. He’d seen my afflictions. They weren’t the same as His had been, but nonetheless, they had plowed long upon my back, our backs. One message from this verse stands out. Yet, they have not prevailed against me. The Lord has made me, my family, us, able to stand victorious—and for that, in the midst of all of our scars and the chaos of life, I’m so thankful. It hasn’t been easy. There were times when I crawled because of it. There were tears. There were some losses. There were some mistakes along the way. There are some things that aren’t quite the way I’d like them to be. We’ve had our fair share and then some of setbacks, but oh how good the Lord has been. He has not allowed the enemy to prevail against us. He’s given us purpose, a home, some family around us, church family, friends and community, a sense of belonging, good health, and filled our home with many wonderful things to enjoy. He’s doing wonderful things in the lives of our children, and my guess is, He’s certainly not done yet. We have clean water, food, and vehicles in our driveway. Sure, life is sometimes complex, and I don’t always understand or like the delays along the journey. I don’t even like some of the ways in which some things have turned out, but one thing is clear. They have not prevailed against me. We may have been tortured in a sense, but it was nothing compared to the suffering of our Lord and what so many missionaries have faced. We’re book missionaries though, and believe me, we’ve got some scars, but they have NOT prevailed against us. The Lord has taken everything in our world and turned it around for good because we love Him. I give Him all the praise and glory. We serve a supernatural God who has a supernatural ability to meet our needs. In fact, most of the things I’m hoping for are just a tiny fleck in the big scheme of things. Will it all be the way I’d like it to be? No, of course not. Psalm 115:3 says, Our God is in heaven; He does whatever pleases Him. It’s not always necessarily going to turn out the way I’d like it to turn out, but I have to be honest, what He’s done with my life is nothing short of an incredible miracle and I’m so thankful, even though it isn’t exactly the way I’d always like it to be. Still, I’m content, and I know how to abound in all situations and how to be thankful in all situations, because my Master has taught me. I’m looking forward to seeing what He will do through and with us in 2019 and what we can do for Him in 2019. When I’m reading books, making dinner, thinking about my future book plans, and watching those movies, maybe squeezing in a little writing time each day, I’ll be calling forth some things by faith that I know the Lord wants for us. May it be a year when most of our bumps and bruises are smoothed out and the hiccups of life removed far from us. May it be a fruitful year of great increase. Lisa M. Prysock is an award-winning, bestselling, Christian and inspirational author of 15 novels. She and her husband of more than 20 years reside in Kentucky. They have five children, grown. 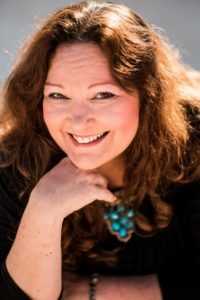 She writes in the genres of both Historical Christian Romance and Contemporary Christian Romance, including a multi-author Western Christian Romance series, “Whispers in Wyoming.” She is also the author of a devotional. Lisa enjoys sharing her faith in Jesus through her writing. Lisa has many interests, but a few of these include gardening, cooking, drawing, sewing, crochet, cross stitch, reading, swimming, biking, and walking. She loves dollhouses, cats, horses, butterflies, hats, boots, flip-flops, espadrilles, chocolate, coffee, tea, chocolate, the colors peach and purple, and everything old-fashioned. She adopted the slogan of “The Old-Fashioned Everything Girl” because of her love for classic, traditional, and old-fashioned everything. When she isn’t writing, she can sometimes be found teaching herself piano and violin, but finds the process “a bit slow and painful.” Lisa enjoys working with the children and youth in her local church creating human videos and plays or programs incorporating her love for inspirational dance. A few of her favorite authors include Jane Austen, Lucy Maude Montgomery, Louisa May Alcott, and Laura Ingalls Wilder. You’ll find “food, fashion, fun, and faith” in her novels. Sometimes she includes her own illustrations. She continues the joy and adventure of her writing journey as a member of ACFW (American Christian Fiction Writers) and LCW (Louisville Christian Writers). Lisa’s books are clean and wholesome, inspirational, romantic, and family oriented. She gives a generous portion of the proceeds to missions. Discover more about this author at www.LisaPrysock.com where you’ll find free recipes, devotionals, author video interviews, book trailers, giveaways, blog posts, and much more, including an invitation to sign up for her free newsletter.